It is the unloved Underground line more prone to delays than any other. Now a firm of London architects has come up with a radical solution to the Circle line’s problems — replace it with a high-speed travelator. The team behind the idea claim that a three-lane moving walkway through the line’s 17-mile circuit could shorten journey times, boost capacity threefold and improve health. Passengers would step from “feeder” walkways moving at 3mph onto a yellow “slow lane” going at the same speed through stations but accelerating to 6mph and then 9mph in lit tunnels. There would also be a “middle lane” , coloured orange, with a top speed of 12mph, and a 15mph red “fast lane”. Christian Coop, design director at City Road-based NBBJ, said the outlandish proposal was developed in response to a challenge from think tank New London Architecture for ideas to improve daily life in the capital. It takes about an hour on average for a Circle line train to complete a loop but Mr Coop said this could be reduced to 56 minutes by someone walking at an average pace of 3mph on the “fast lane”. 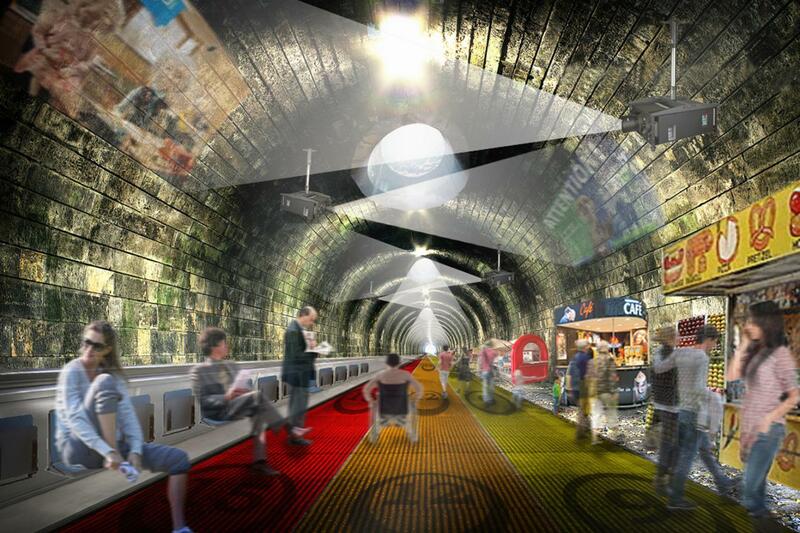 NBBJ researchers calculate the travelator would allow up to 55,000 people to use the Circle line at any one time. Britain’s first travelator was installed at Bank station 55 years ago. In Paris, a “trottoir roulant rapide” opened at Montparnasse station in 2002, moving at 6mph over 180 metres. It was slowed to 3mph after a spate of accidents .